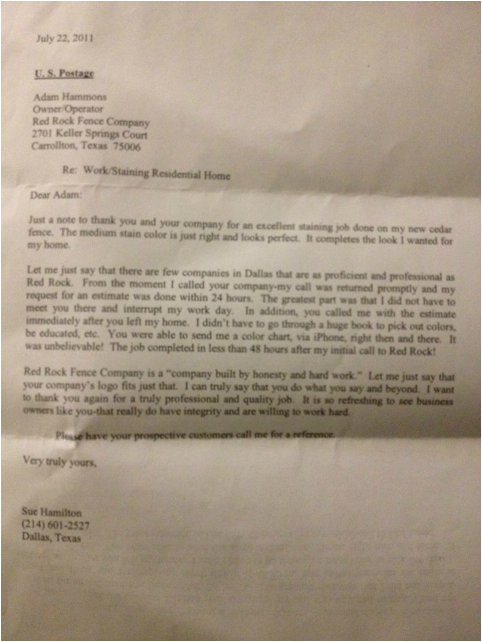 "Red Rock Fence Company was prompt, courteous and reliable. We are thrilled with the way our new privacy fence turned out and would recommend Red Rock for any fence projects in the Plano area." "We had a break in at our office and needed emergency chain link fence repair after a section was removed and needed replacement. We received calls from contractors saying they would not be able to handle our situation, which was an emergency, for several days. Red Rock was the only company that came out within one business day and took care of the broken chain link. Thanks again!" "We received several different quotes for fence repair and staining and I'm glad we went with Red Rock Fence. Their owner was polite and on time and walked us through every step of the repair process so we knew what to expect. All employees wore uniforms and didn't make a mess. The job was finished on time as promised and the price was fair. Trust me, having been burned by shady fence repair "companies" in the past, it's best to get it done right the first time. I recommend them to anyone. Great job." very pleased and my fence looks great. As far as the work...it was a great experience and I would use them again. Rock to do the project. would totally use Red Rock again and I will recommend them. In response to this report by Adam Hammons-Owner at Red Rock Fence. Removed 2 year old builder fence post and installed metal poles with concrete.